We specialise in deep sea fishing trips on She Likes It II. My home port is Shoreham Harbour in Brighton. Or to be precise, “Hove Actually “. Fishing trips made up with individual anglers are called an “Individuals Day”. When chartered by one party that is called a “Whole boat booking”. If you are looking to go Fishing in Sussex — look no further than Sussex Fishing. If you are an experienced angler, or just beginning with this sport you are welcome aboard. Anglers of all levels of experience can come fishing afloat. If you require some help or tuition, this is freely given. If you require a rod and reel I can hire this out to you for a small charge. Tackle and bait can be purchased from the Lagoon Bait and Tackle Shop which is a five minute walk or one minute car ride away. Or, alternatively I do stock frozen bait in the freezer which is right next to the boat and a selection of fishing tackle that I can sell. Book a fishing trip NOW! Any Questions ? Bass, Bream, Smoothhound, Spur Dog, Tope, Bull Huss, Plaice, Dab, Ray’s, Garfish, Mackerel and even Conger on the ground and reefs from Brighton to Littlehampton. Deep sea fishing trips to catch a big Cod! 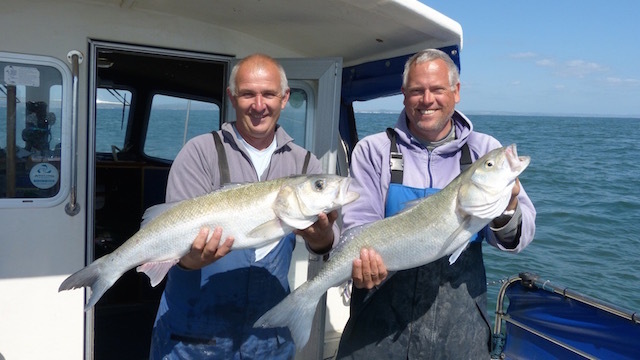 If you are looking for a Cod fishing trip, the winter time is the best time to give it a go. There is a very good reason for this. From late autumn and through the winter, Cod migrate to shallower waters to spawn. Cod in the region of 20-30lbs are not uncommon with the very occasional one of 40lb+. It can be a waiting game and the number of Cod caught can vary from year to year. I would fish for Cod with a sliding ledger, equipped with a pennel rig of two 6 or 8/0 hooks. A large smelly bait is required, made up from squid, worm or cuttle fish an this must be kept hard on the bottom. Then you sit back with a hot drink wrapped up to keep the cold out, listening to the radio and chatting with your fellow anglers, waiting patiently for the tell tail gentle nod of the rod tip. Typical species caught on the wrecks are predominantly Pollock and Cod with Bass and Ling to a lesser degree. In the winter and through to the summer we usually fish on the drift over the wrecks with lures. From July / August time I also start fishing (Tide dependant) the wrecks at anchor. 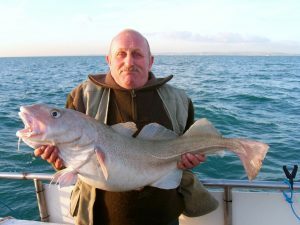 The greater variety of fish caught at anchor include Cod, Ling, Conger, Bream and several others including the obligatory Pout Whiting. 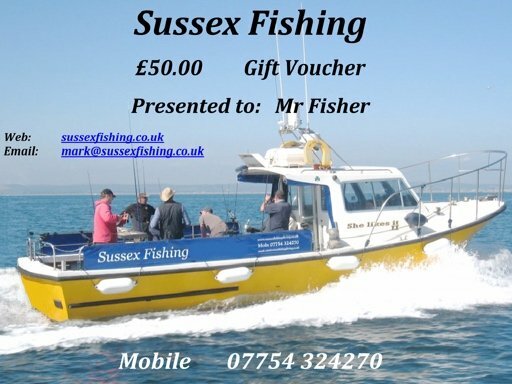 Our main aim, is that for everyone who comes on one of our deep sea fishing trips and is a guest of Sussex Fishing. That he or she will have a safe, enjoyable, productive day out on the water and then go home with some fish for the table. Regardless of your experience, we will do our best to ensure you have an excellent day out. You can keep what you catch so long as it is above the minimum landing size and it is not a protected species. The following link opens a new window on the Angling Trust website minimum landing size. Please note. It is illegal for fish to be sold on. Offer only valid on trips at non discounted rates. Charges will be at current rates and subject to change. Fishing is Rok Max's passion, and like you guys they regard any fishing trip as a great adventure. Allan and Duncan are here to help you plan your trip, select the correct tackle and even advise on the best tactics. Rok Max offer a huge range for boat fishing, shark fishing, big game fishing and saltwater fly fishing plus a range of clothing and sunglasses.